Assemblies for Democracy is a coalition of democratic groups & individuals, which include Occupy, A World to Win, and the Haldane Society of Socialist Lawyers. My background is occupy, which called for ‘Real Democracy’. Most participants in occupy were driven by either a conviction that we live in an increasingly unequal society; characterised by the growing inequity between the 1 % and the 99%, or that we are facing an ecological collapse. Frequently people were driven by a commitment to both economic and environmental justice, and often by the belief that these issues were linked, and the cause of war and other social injustices. Occupy identified the ‘system’ as the problem, and the lack of democracy in particular as a cause for these twin crises . We were collectively convinced that the solution to our systemic problems lies in fixing our broken democracy . The last line of the initial statement issued one of the first assemblies in October 2011 referred to our gathering outside London Stock Exchange at St Paul’s Cathedral and the growing global movement, and declared that this is what democracy looks like. The emphasis was on participative, rather than representative democracy, in part because representative democracy was considered captured by corporations, banks and the 1%, or more accurately the super wealthy 0.1 %. This call for Real Democracy was mirrored in the gatherings that preceded Occupy, such as the Indignadoes of Spain and the Arab Spring .Occupy saw ourselves as allied to those movements, and to the subsequent waves of people that have gathered in the town squares seeking change through ordinary people coming together. The ‘Nuit debout’ movement sweeping across France now is one such more recent manifestations of this movement. These night assemblies are a modern echo of the ancient assemblies of Greece, or the folk moots that once used to take place in England, indeed once outside St Paul’s Cross in London. They are a theoretical and practical rejection of the representative political structures as being inadequate, or captured by the elites, or both. The recent revitalisation of internal democracy in the Labour party has seen a some reversal of this trend, but this has been contested by the established elite of the Parliamentary Labour Party with its refusal of membership voting rights and a rhetoric that refutes the importance of a participatory grassroots engagement by members. The resurgence of membership has been widely treated with suspicion at best and outright hostility at worst. The present system, with its emphasis on parliamentary democracy and political parties, is losing legitimacy fast. And yet that is the very thing that the political establishment seem to be attempting to prop up: the recent government declaration of British Values defined democracy as ‘Parliamentary Democracy’, and opposition to this as extremism. How these values were derived is unclear – but they certainly were not arrived at through extensive democratic deliberation or public participation. The evidence is that people are calling for better democracy through both protest on the street and by increasing engagement in civil society and direct democracy. But are more democratic societies better? 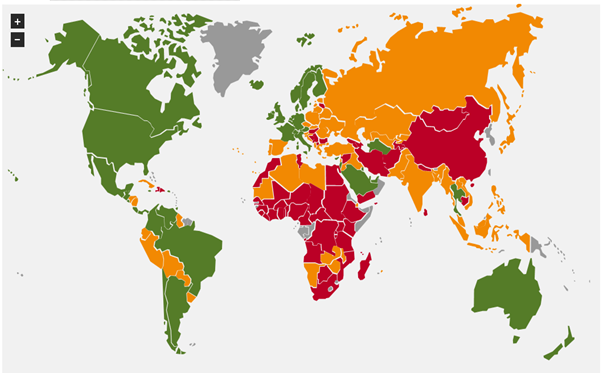 Certainly there is a correlation between wellbeing and healthier democracies. More democratic societies tend to both more equal and better at ecological stewardship. If the goals of social movements are related to reversing economic inequity, and preventing ecological collapse then people’s focus on democracy as the best route to achieving these aims does indeed look like an effective strategy. 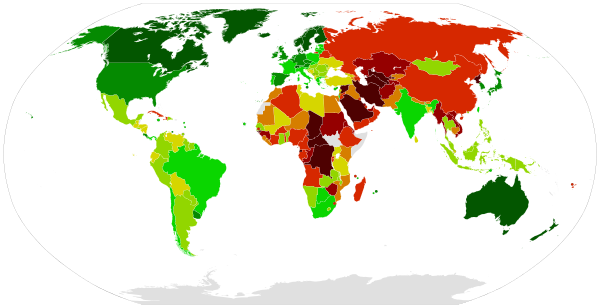 Democracy: The Economist Intelligence Unit Democracy index map for 2012, with greener colours representing more democratic countries. The word democracy comes from ancient Greek δημοκρατία (dēmokratiā), which combines dēmos, the “people”, with kratos, meaning “rule”, “power” or “strength”. Put together, the literal denotation of democracy is “rule by the people”, culminating in a popular form of government. The term was coined in the 5th century BCE to denote the political systems then existing in Greek city-states, notably Athens; the term is an antonym to ἀριστοκρατία (aristokratia) “rule of an elite”, which the people of Greece managed to overthrow, then if not more recently. Democracy is not a synonym for elected representative, or parliamentary democracy. In fact in Greece democracy was practiced largely through a combination of citizens directly taking decisions via popular assemblies, and via sortition or Demarchy, with the use of lots to fill judicial, executive or administrative functions. Our country dose not just rely on parliamentary democracy: our judicial system uses Sortition to appoint juries; Referendum are a form of Direct Democracy , as are the recently introduced right to raise issues in parliament via petitions. Other common forms of democracy are Delegate democracy , often used by unions and the Spanish anarchist tradition; Participatory democracy, where citizens are consulted, engaged or co-design services, particularly those that directly effect them and Economic democracy, which takes the form of social enterprises, cooperatives, food sovereignty (La Via Campesina), and Commoning. Other forms of emerging democracy are Holacracy and Sociocracy, systems of governance with an organizational structure based on cybernetic principles. Assemblies for Democracy is calling for a citizen led constitutional assembly to develop a Democracy for the 21st Century. This is not just about the process of democracy, but also to consider the constitution as a whole. A constitution can be defined many ways. Aristotle (b. 384 – d. 322 BCE), said the constitution is the “the way of life” of the citizens, analogous to the soul of an organism. A body has a constitution. Political constitutions are usually written documents, but the UK has an uncodified constitution, which is a type of constitution where the fundamental rules often take the form of customs, usage, precedent and a variety of statutes and legal instruments. So what constitution system do we live under in this country? While our country is popularly referred to as a democracy it is actually formally described in text books as a Constitutional Monarchy, and I think this is far more accurate. Whilst elected party political representatives have the dominant role in government, power also still remains in the hands of the still feudal House of Lords , and of course the Monarchy. However it is hard to be clear about how power is exercised, and who actually make decisions and for whose benefit, given our unwritten constitution. It is even more difficult to identify the goal of the system. Certainly the emphasis in the majority of the major parties and commentators: the governing class, is on ‘growth’ or profit as the ultimate goal of the system and this is arguably the implicit goal of our current system, or constitution. This implicit goal is the target of one of the most common banners on display in countless protests: People and Planet, not Profit. A constitutional document sets the frame for society, it is the law of laws, defines the goals of a system, sets out how we are governed, the process by which decisions are made, and decides the appointment and distribution of power. Our constitution’s partial democracy has been found wanting in its ability to now reflect the will of the people. The criticism of the concentration of wealth and power in the 1 % points out that power is now held by fewer and fewer people; that power is not distributed equitably and that is to the detriment of the many – the 99 %. The implicit goal of the system: profit and growth, rather than people and planet, have also been identified as the cause many of our systemic problems. Constitutional change can appear removed from popular protests, and as a dry academic subject, and not able to generate popular momentum. Certainly making constitutional change relevant is a challenge. However there is a precedent for making this a popular movement: most historic social movements have demanded democratic changes which have culminated in constitutional changes. Indeed most of our constitutional documents are a result of social movements. The Magna Carta and its companion treaty the Charter of the Forest arose from protests from the barons and common people against the King and his Sheriffs on such matters such as arbitrary and cruel punishment; the imposition of taxes without common consent and for the common profit; and the enclosure of the commons. During the English Revolution, also known as the Civil War, the Levellers and New Model Army agitators helped constrain the power of the Monarchy and ensure regular elections to parliament, and this was codified in the Bill of Rights. The Leveller’s more radical calls for universal suffrage would need to wait for the Chartists and Suffragettes, who eventually paved the way for Universal Suffrage. The rise of socialism, and the fight against fascism, resulted in the Universal Declaration of Human Rights, and the better securing of our liberal and social rights. More recently Iceland’s Pots and Pans Revolution turned to constitutional change as a way of permanently founding a better democracy on a new constitution and preventing another financial crisis. Following the 2008 financial collapse of the banks Iceland’s people rose up. Bankers were jailed and the government forgave the debts of the people (mortgages) rather than just bailing out the banks. There was also a significant and on-going social movement for democratic and constitutional change. Democracy campaigners were able to successfully push for a citizen led constitutional convention. This resulted in a new fully articulated constitution, which was endorsed by the people via a referendum. It contained many clauses that would help to deal with financial crimes, inequity and ecological collapse, including articles granting rights to information and for natural resources to be held in stewardship for the nation. Whilst this constitution was not adopted by the parliament, the signs are good that this initiative will ultimately result in change: Iceland’s Pirate party are leading in the polls and have said they will implement the draft constitution, if they are voted into power. Assemblies for Democracy are championing a citizen led constitutional convention because we need a process whereby ordinary people can devise a constitution that is in the interests of the people. A process that is led by parliamentarians is very unlikely to be able to tackle our current democratic deficit, the decay of representative democracy, or the concentration of power in the 1%, given all the vested interests involved. Assemblies for Democracy held a Re-Imagining Democracy event in March 2015 to explore citizens’ convention and following this affirmed the democratic principle of power resting with the people. This reflects the true meaning of democracy – the will of the people. Starting with this principle effects decisions about the design of a constitutional convention: it necessities the people being able to set the agenda, participate in the decision making process, and ultimately the people deciding its outcome. The design of such a process offers us an opportunity to develop a prefiguarative democratic process that will hopefully lead to a better the democracy, fit for the 21st century. The Magna Carta, our first modern constitutional document, declared at the beginning that this was agreed by ‘common assent of all the realm’. Nowadays a new constitutional agreement cannot be decided by a gathering in a meadow. Instead we need to use modern methods of democratic of deliberation and decision making that will enable us to arrive at a new common agreement, by and for the people, which is able to hold the different constituents together for the common good. [iii] Turnout for both local and national elections has experienced a steep decline. The General Election of 1950 saw a turnout of 83.9 per cent, yet figures have dropped dramatically, particularly after 1997, sinking to an all-time low of 59.4 per cent in 2001 and only recovering slightly to reach 61.3 per cent in 2005. After 1998’s historic low of 28 per cent, turnout in local elections has hovered just above the 30 per cent mark, with some wards recording figures as low as 12 per cent. [iv]“ In a global survey ranking countries according to electoral turnout, the political inclusion of disadvantaged or minority groups, membership of political parties, citizens’ stated interest in – and active engagement with – politics and political protest, and the efforts made by public institutions to promote political participation, the UK was found to have the lowest levels of political participation in the developed world.10The Economist Intelligence Unit’s Index of Democracy 2008 (London: Economist Intelligence Unit, 2008).